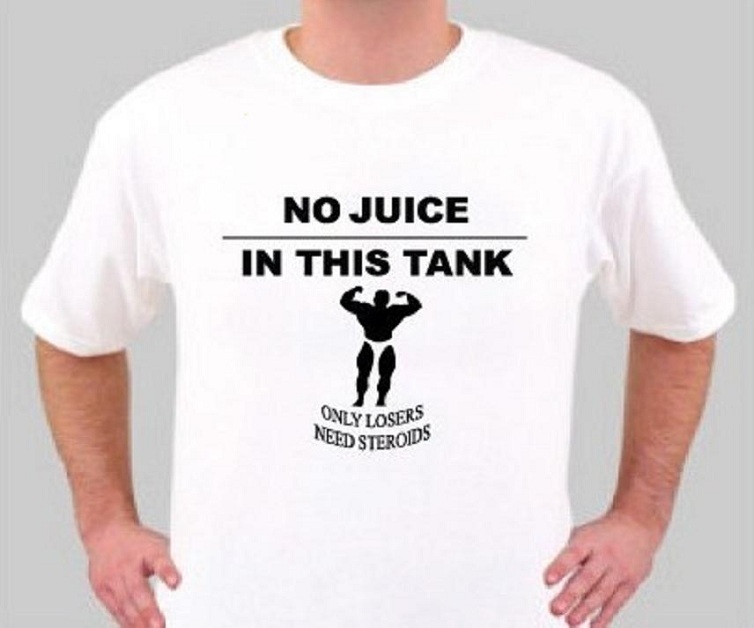 100% of funds generated with the sale of NO JUICE IN THIS TANK T-Shirts will be retained to cover expenses of ongoing Anti-Steroid efforts through this website. There are major interviews that are in the process that require travel, logding, and tangible equipment. Furthermore, we’re planning to co-sponsor tested fitness competitions and educational events with our web partners including the United States Anti-Doping Agency. 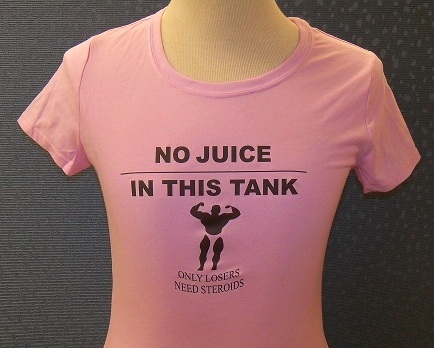 Our apparel offerings involve T-Shirts with the popular slogan: “NO JUICE IN THIS TANK”. Color options for the T-shirt include (a) Bright White or (b) Pink. We use high quality, heavy duty, shrink resistant material with proven anti-fade silkscreening done by reputable establishments located within the United States. To purchase individual shirts via credit card, hit the “Buy It Now” button. For large group orders, feel free to contact us via the email address: theinclinedathlete@yahoo.com indicating desired quantity and delivery time along with a day time telephone number. Note: Large group orders will benefit from a lower allocated shipping charge per unit ordered. And remember: NO PERSONAL CHECKS!